^ 2.0 2.1 2.2 2.3 2.4 2.5 2.6 2.7 2.8 Maria Sharapova. WTA. [September 1, 2015]. ^ MILLION DOLLAR CLUB (PDF). WTAtennis.com. （原始内容 (PDF)存档于2011-06-26）. ^ 莎拉波娃被禁赛两年 拒绝接受处罚将上诉_图片频道_新华网. news.xinhuanet.com. [2016-07-22]. ^ 莎娃排名将升世界第四 要将义卖捐出接济俄同胞,新浪体育. Accessed April 29, 2012. ^ Sharapova soars past Vinci in Stuttgart opener.. WTA. 26 April 2017 [26 April 2017]. ^ Myskina stands by Fed Cup threat, BBC News, November 2004. Accessed July 23, 2008. 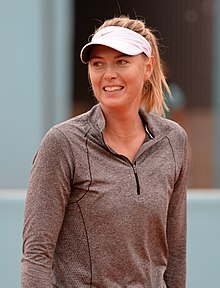 ^ Sharapova delays debut for Russia, BBC News. Accessed July 23, 2008. ^ Sharapova to miss Fed Cup debut, BBC News. Accessed July 23, 2008. ^ Sharapova pull-out angers Russia, BBC News. Accessed July 23, 2008. ^ Russia drop Sharapova for Fed Cup, BBC News. Accessed July 23, 2008. ^ 20.0 20.1 20.2 Barry Flatman. Sharapova: a cow on ice?, The Times, May 31, 2007. Retrieved July 23, 2008. ^ Maria Sharapova unwilling to trade her Russian citizenship for anything, Pravda.ru, October 2005. Accessed July 23, 2008. ^ Henin is best of her generation. BBC Sports. May 15, 2008 [July 23, 2008].